While hanging out in Nairobi after the overland expedition had ended, I had the amazing opportunity to visit the Elephant Orphanage run by the David Sheldrick Wildlife Trust- a facility designated to the protection and care of orphaned elephants, located in Nairobi National Park- a small game reserve right near the city. Some others on the overland trip had visited the facility on our first pass through Nairobi, and had highly recommended a visit if I had time after my trip ended. I had made sure to book a couple of extra days in Nairobi to relax and explore after the trip concluded, and getting out to the elephant orphanage was my top priority after saying my goodbyes to Peeky and the rest of the crew. The elephant orphanage’s primary function is to rescue injured and/or orphaned baby elephants from the wild, nurse them back to recovery and full health at the facility, and then eventually release them back into the wild in Tsavo National Park, Kenya’s largest wildlife reserve. 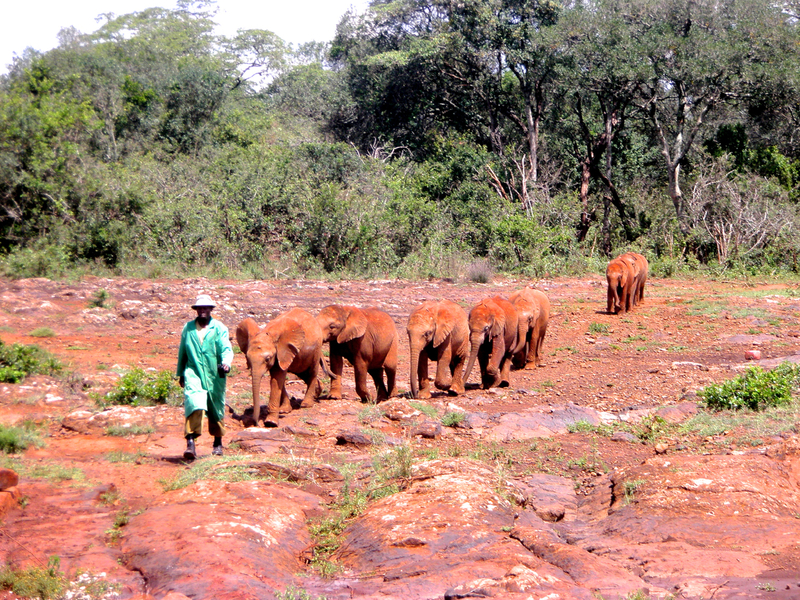 This program started in 1954, and since then, they have successfully rescued and hand-reared over 80 orphaned elephants, with over 40 of these now living free with their wild counterparts in Tsavo National Park. It is a hugely successful program, and is at the very heart of the elephant conservation effort in Kenya today. It was a warm, sunny morning in Nairobi, and I was anxious to get going. Luckily, there was another person staying at the hostel who wanted to go to the orphanage that day as well, so we split the cost of a taxi for the day, and soon enough, we were off. We had learned that there is only one daily viewing time (11am), and wanted to buy our passes and get down to the viewing area before the crowds showed up. After leaving the hostel, we bumped along the dirt roads skirting the city, yet another “African Massage” due to the gaping potholes and innumerable speed bumps. Eventually, we saw the signs for Nairobi National Park, passed though the entry gate, and drove up to the parking lot outside the entrance to the orphanage. Quickly, we bought our tickets and headed down the dirt trail to the viewing area. We came out of the trees and into a clearing, and positioned ourselves against the ropes that marked the edge of the viewing area. There were several oil drums full of water, various bushels of tree branches and shrubbery, and a few boxes that held what looked like giant baby bottles, all situated around a small pool of muddy water. A few uniformed trainers and keepers were milling about the grounds, making sure everything was ready for the elephants’ arrival. We were looking around, wondering where these elephants were hiding, where they were going to come from, but that mystery was quickly solved. All of a sudden, there they were- a dozen or so baby elephants- trotting, stumbling, and bumbling down the hill behind a few uniformed trainers. 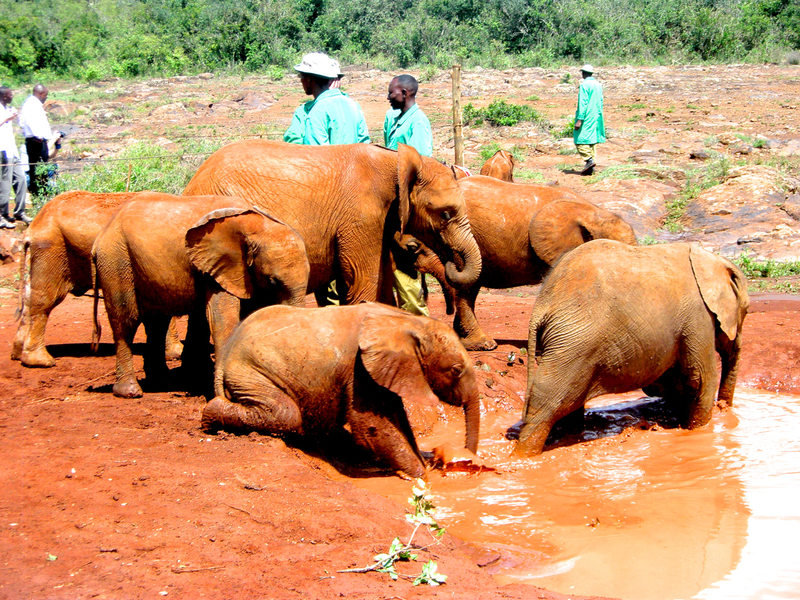 This was the ‘pre-school’- the youngest elephants in the orphanage. They were SO cute and VERY funny- tiny little elephants, some covered with blankets to protect them from the sun, all anxious to run in the mud and play in the pool, hounding the keepers for the bottles full of what we learned was the elephant equivalent of baby formula. They plopped down and rolled around in the dirt, pushing each other around and pulling each others’ tails. You could tell they were hungry by the chorus of sucking sounds they made while downing the contents of the oversized baby bottles. Some were more concerned with eating, others wanted to play, and still others were interested in the strange people that were lined up along the ropes. The curious ones would come plodding over, and examine you with the tips of their trunks, giving a little kick with their small legs to see what would happen. We were free to touch the elephants, feeling the coarseness of their leathery skin, the sandpaper-like flaps of their ears. After their curiosity was satisfied, it was off to play with their buddies, splashing into the pool, and then struggling to get out due to the slippery edges around the water. It was hilarious- it was easy to see how someone could make saving baby elephants their life’s work. Eventually, it was time for the pre-schoolers to head back, and once they had been herded out of the feeding area, the next group came rumbling down the hill. These elephants were definitely bigger, but were still very young, not even adolescents by elephant standards. They were kept separate in order to prevent them from accidentally hurting one of the younger elephants while they were playing. When they had satisfied their hunger with the bottles and bushels, playtime began, and it was clear that these elephants played a bit rougher than the first group. There were pushing matches, trying to force one another into the pool. They sat on each other, chased each other, trumpeting and bellowing all the while- again, hilarious to watch. We got some great photos, being so close to the action. It was a really great experience, but of course, all too soon, it was time for the second group to head back to their stables, and the day’s events were over. 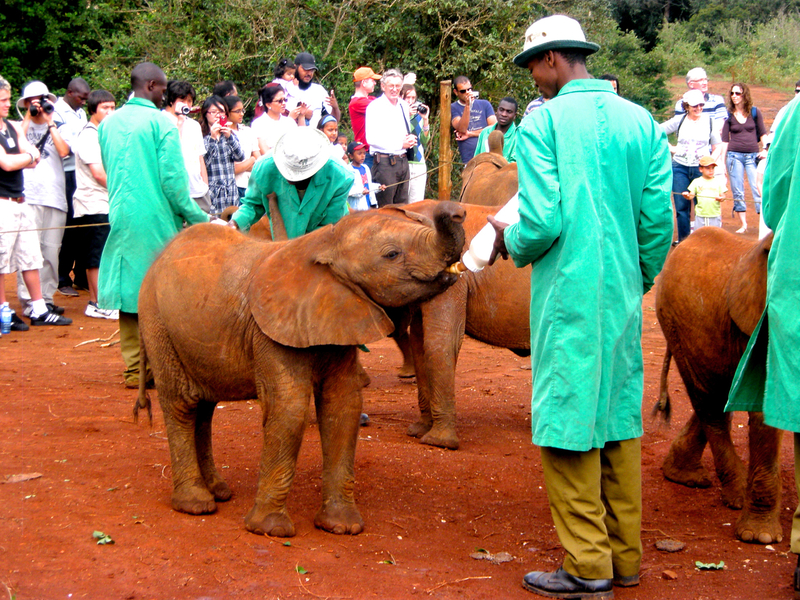 A day at the Elephant Orphanage- definitely worth the price of admission- and for a good cause, to boot!